Published in L. Frank Baum's collection, American Fairy Tales in 1901. 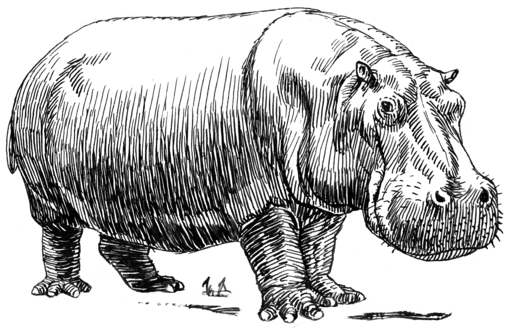 On one of the upper branches of the Congo river lived an ancient and aristocratic family of hippopotamuses, which boasted a pedigree dating back beyond the days of Noah--beyond the existence of mankind--far into the dim ages when the world was new. Therefore the black people who dwelt in that region called him "Ippi"--the jolly one, although they dared not come anigh him on account of his fierce mother, and his equally fierce uncles and aunts and cousins, who lived in a vast colony upon the river bank. "Why, 'tis Ippi--the Jolly One!" Gouie had counted the days and knew when to expect Keo; but he was astonished at the monstrous size to which his captive had grown, and congratulated himself on the wise bargain he had made. And Keo was so fat that Gouie determined to eat him--that is, all of him he possibly could, and the remainder of the carcass he would trade off to his fellow villagers. Add The Laughing Hippopotamus to your own personal library.